Cat scratch toys are in other words toys which while your cat is playing is helping to keep their claws in good condition and more importantly away from your furniture. The toys I have highlighted on this page have been chosen for their unique design and longevity (Some toys just last long once they have been submitted to sharp claws and teeth for a few days). They have also been chosen as they provide your cats with lots of fun play time whist looking after their claws. Every cat I have ever had absolutely loves a toy with a rough scratchy surface. Something they can really get their claws and teeth into. Cats loves to sharpen their claws and have a good stretch at the same time. Many of these toys will really give your cats a good work out, either by running and chasing or allowing the cat to stretch out. A cats claw needs regular looking after to remove the old outer shell of the claw. In the wild a cat would use a rough tree bark to help remove the dead claw sheaf. They toys are a much more fun way of doing the same thing. 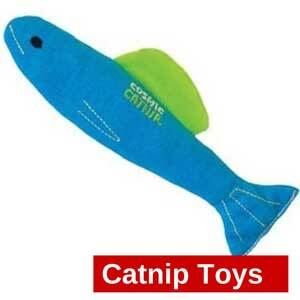 Cat scratch toys come in all sorts of shapes and sizes that your cat will find enticing and attractive. We think they look pretty good as well. 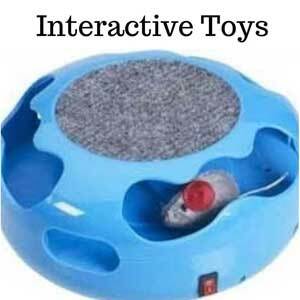 This is a really fun toy for your cat. they love to chase balls, but they always seem to find their way under furniture, don't they? Not with this toy. A lightweight ball is placed inside a run which means that the ball has free movement around the frame but can't get out. This means your cat can bat it as many times as they like without losing the ball. The center is a scratching surface which allows your cat to sharpen those claws while playing with the ball. Ever watched your cat do one of those long stratches followed by scratching at the carpet? 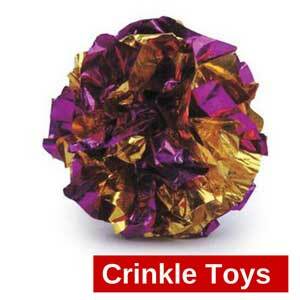 I have and this is what makes this incline toy so perfect for your cats natural instincts. The incliner also includes some natural catnip which can be sprinkled on the scratcher to entice them to use it rather than your furniture. I like this scratcher because it is long wearing (the scratching pads are reversible) and you can buy refills for the scratcher as it wears out. So it saves me money too. This cat scratch toy is made from natural loofah sponges and Sisal cord. The loofah fibres allow for easy scratching by your cats claws and the attached cords will help to keep your cats teeth clean too. I love the fun design of this toy and I find that the bright colors really brightens up my cats play area. After watching cats use this Loofah based toy I can really see that they like its unique texture. Cats love mice right? Well they will really like this over sized stripy mouse which they can claw to their hearts desire. The mouse is 24cm x 10cm x 10cm so there really is lots for your cat to get their claws into and bite too if they want to. So much better than the real thing don't you think? 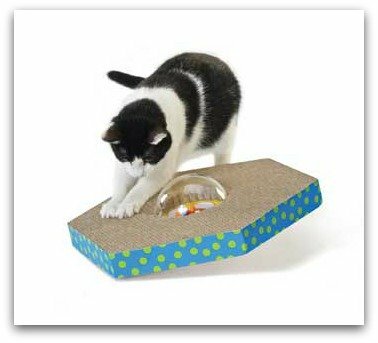 A wobble board for cats, what a great idea. This will keep them occupied and interested as they scratch at it. The toy has two sides to it so even if it is flipped over by your energetic cat they will still be able to play with it. Its corrugated surface means that it can withstand tough play and so is particularly good for larger cats. Cats rely on their claws to help them get away from their enemies or to be able to defend themselves when needed. Good sharp claws are needed to climb trees, get over fences and get away from danger at all times. Scratch cat toys are perfect gifts to give to your cat, as you know you are helping them to stay healthy and safe outside. If your cat has no where inside the home to naturally sharpen their claws they will use the next best thing, your furniture and carpets.